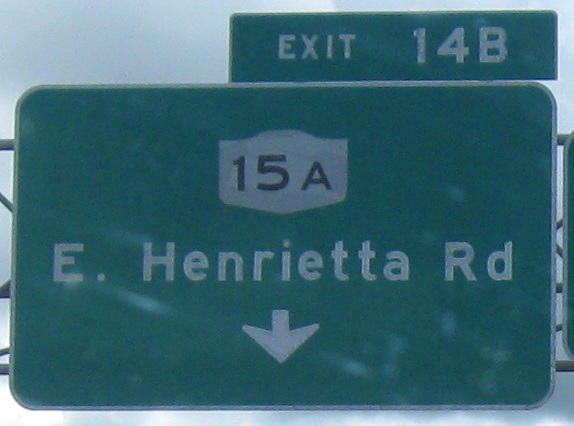 In 1974, US 15 became NY 15 north from NY 17 (and now I-86) to Rochester. The shield, and most likely entire assembly, in the first photo (courtesy Doug Kerr) dates from around then. It's been replaced by something awful as seen on the first northbound assembly in the second photo. 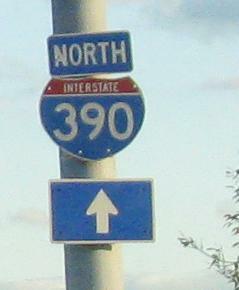 Soon it will all be gone, because NY 15 has just been removed from I-390. The bubble shields (stretched regular shields instead of the special 3-digit template) have even invaded side streets. 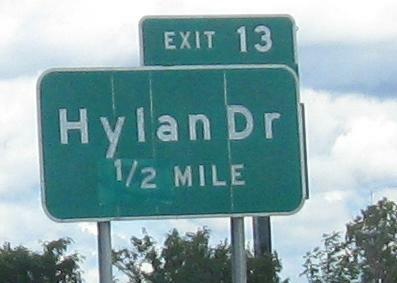 This is Hylan Dr. SB at I-390 Exit 13. A collection of NB signage. 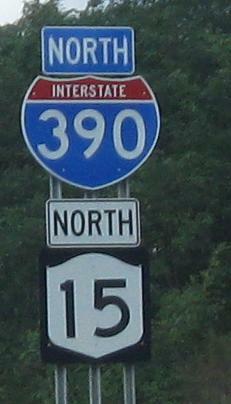 The changeover from 390I to 245 happens between Exits 3 and 5, originally constructed as NY 401 but later being renumbered as an extension of NY 245 from the east. 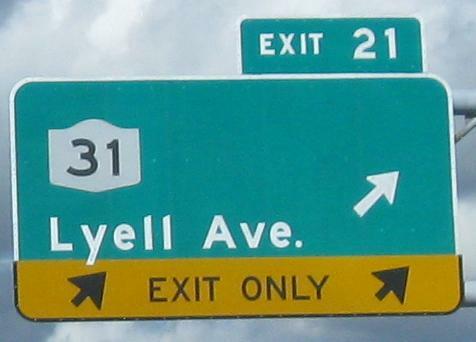 Once the Dansville bypass was extended to both sides as I-390, NY 245 was truncated back to NY 21 where it is now, but the reference markers remain. 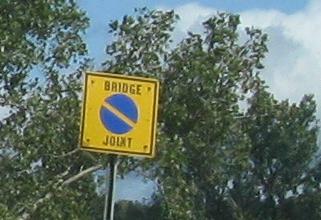 There are two types of bridge joint signs - slash (like this) and dash (horizontal line). From my observation, I think these joints are more severe and require snow plows to raise their plows, but the dash joints have less vertical separation (bumps) and would allow plows to stay down across the overpass. What's your explanation? 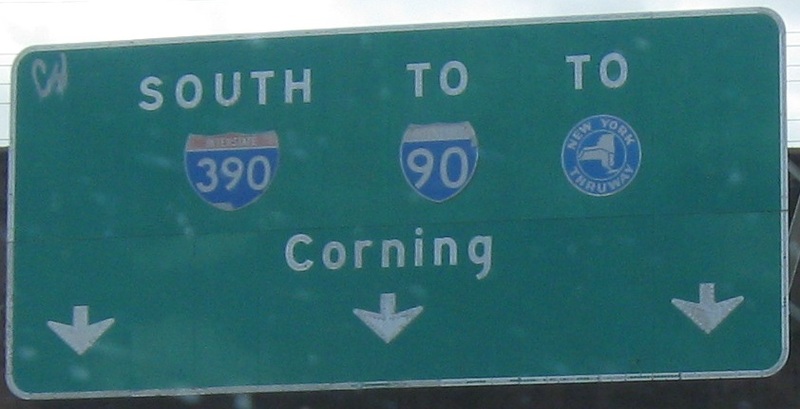 Older SB signage, courtesy Doug Kerr. 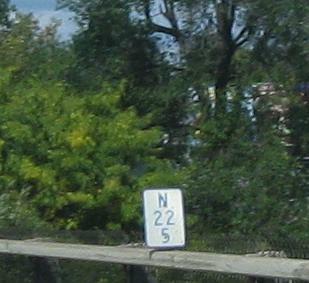 The Thruway button copy and NJ-style US 20A shields are gone now. 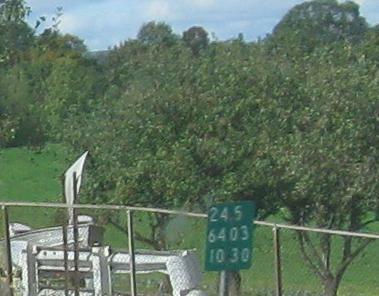 The Exit 7 sign isn't really that old, but I like the murder of crows on top. 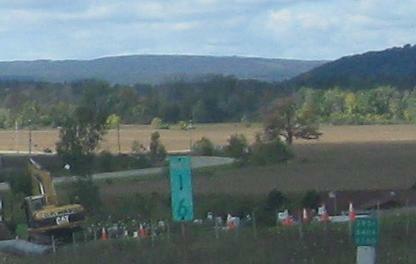 At the bottom of the SB Exit 8 offramp, which as you saw is not NY, but US 20A, again from Doug. Windmills at sunset in the Geneseo area, looking northwest. Button copy, the whole button copy, and nothing but the button copy, SB. 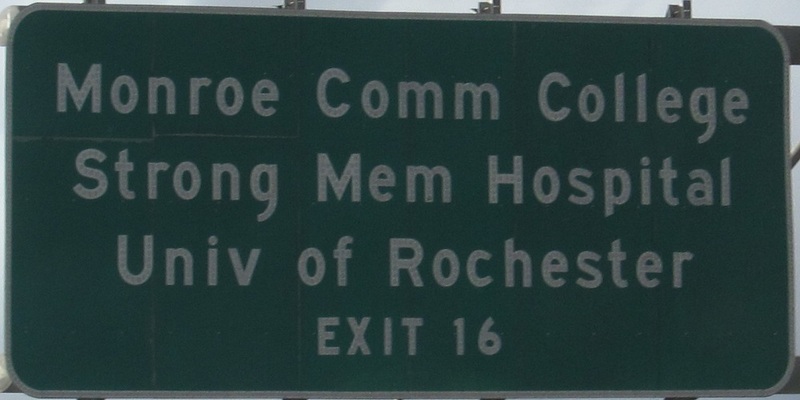 The Rochester runway was just extended to the edge of I-390, so there was no room to reroute the internal road (which may be Eastside Way) next to the highway. Instead, it ducks underneath here, parallel to an airside road that the public can't access. Photo was taken SB. 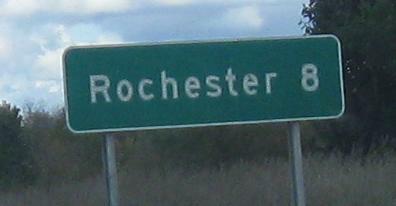 I drive the tunnel on my Rochester page. A lot more button copy is left on the NB side. 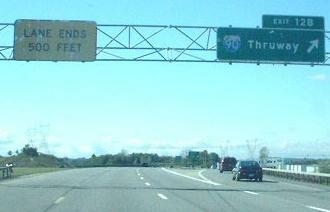 I-390 switches over to NY 390 at Exit 20, but I didn't notice a difference in freeway quality. 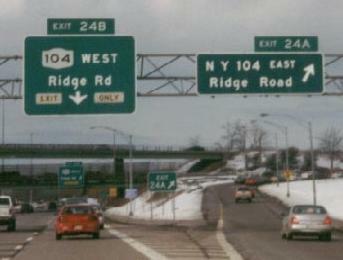 The whole thing was built as NY 47 and not renumbered until 1980. 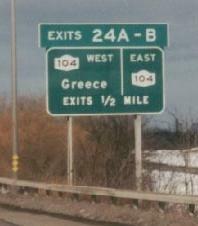 Notice that the advance signs' text is center-justified, but the actual exit signs' text is left-justified. It looks strange when you have a small shield and a long destination name. One of the SB button-copy assemblies that has been replaced, courtesy Doug Kerr. 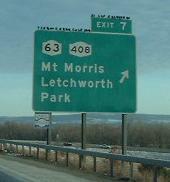 Now-gone button copy on NY 390 NB, courtesy Doug Kerr. 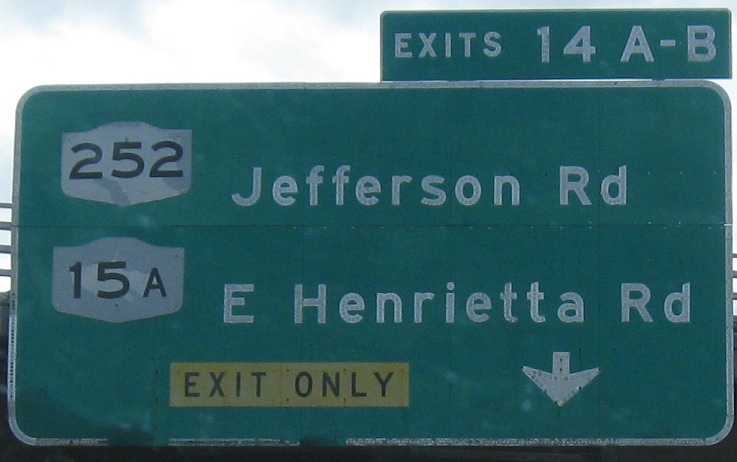 NY 47 ended at then-US 104, and the extension to the last exit (27, for those keeping count) occurred after the renumbering. 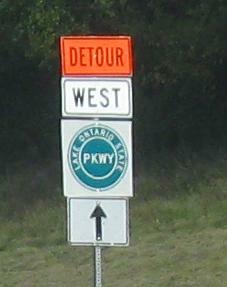 For overpass reconstruction, the Lake Ontario State Pkwy. requires a detour. Not one detour shield out of dozens is cut out.